This NPR All Songs Considered live show and interview with New York rock quintet Ra Ra Riot gave me a good look into the emotions a band encounters when performing before a national audience for the first time. 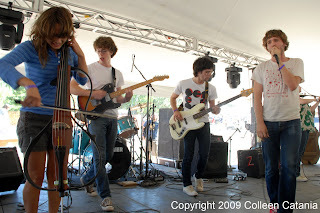 I first saw and reviewed Ra Ra Riot during a show close to their home in upstate New York at moe.down festival in 2007. 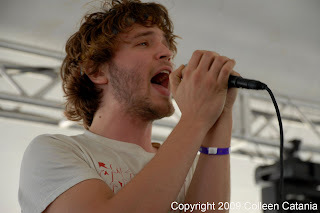 As an indie-rock band with an eclectic rhythmic section they seemed a bit out of place in weekend of full of jam bands, but they still put on a great show that swept me off my feet and caught my attention ever since. This moe.down show was also a few months after their original drummer John Pike died, so during the show I was wondering how they were dealing with the grief and sadness. As they unloaded their gear from the trailer and quickly set up, I wondered how much those emotion fueled their show. So when I finally got around to hearing this NPR backstage interview before their Washington D.C. show this past October, I was pleased to hear them talk about what goes through their minds when performing and how they handled being under the national live concert spot light in 2008 as they promoted their debut album the Rhumb Line. Have you had any insight into a concert of your favorite band lately?